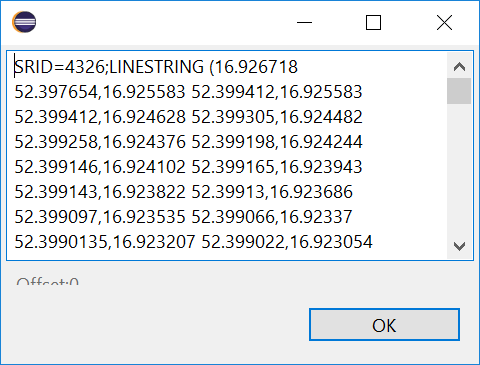 In my previous #GeospatialTuesday blog Calculating a path from IoT GPS data I shared how to create a LineString representing a path connecting the points represented by two decimal columns with latitude and longitude in the table. But what if each point data is already stored in a table as spatial ST_Point? In my case I have a table defined as following. And in my case the table stores GPS tracking points as I walked in the morning a week ago from a hotel to a venue of Code Europe in Poznań, to give a talk on Geospatial SQL with SAP HANA. Luckily, with SAP HANA 2.0 SP 3 there is a new method ST_AddPoint available. So, this is how I approached it using this method in SQLScript. I’d love to hear, if you come up with any other way to do the same! CREATE OR REPLACE PROCEDURE "SANDBOX". "PATH_FROM_POINTS"
I first assign an empty point with Spatial Reference id 4326 to a variable path_temp using WKT standard POINT EMPTY. It would work as well with LINESTRING EMPTY, but I wanted to show that the method ST_AddPoint works as well if starting with a point. Next I use index -1 in the method ST_AddPoint. That means to add the new point at the end of the string. Let me call the procedure now for a day of June 12th, 2018. …which I can copy and visualize once again using http://geojson.io/ website. If you want to try this procedure, but have no data, then you can just simply execute the following INSERT to add a few random points at Sahara desert. And then use the CALL PROCEDURE for today’s date. Please let me know what you would modify or improve in this approach!